Fuel Delivery - All American Towing Inc. Many of our clients have found great comfort and convenience from our “Out of Gas Refueling” service that is provided in conjunction with our emergency towing. Imagine being only a few miles from a gas station when you run out of fuel. When your engine suddenly chugs, you panic knowing that your gas tank is empty. AA Tow is ready to rush to your roadside location to bring you enough fuel to get you to a filling station and restore your safety and peace of mind! Our tow operator will wait with you until the fuel gets through the lines and your car starts. If your vehicle doesn’t start (maybe due to a fouled fuel line or component problem), rest assured we will get you to where you need to be and your vehicle to the shop, or dealership, of your choice. We won’t leave you stranded! 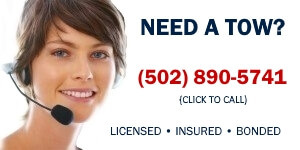 We’re a Louisville tow company that cares!